1. 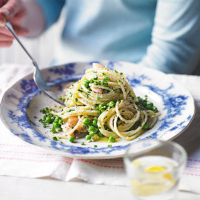 Cook the spaghetti in boiling water for 10 minutes, adding the petits pois for the last 2-3 minutes. 2. Meanwhile, melt the butter in a frying pan and fry the chicken for 5-7 minutes until golden, stir in the lemon zest and juice, Parmigiano Reggiano and chives, then cook for 1 minute. Check that the chicken is cooked through with no pink meat. 3. Drain the spaghetti and stir into the chicken with a dash of the cooking liquid and season.